IRONguard Knuffi warning and protective bumper guards act as a buffer zone for people, machines and objects; absorbing hard impacts and preventing injury and damage. Injury to personnel and downtime due to repairs can be a thing of the past. Knuffi performs well in temperatures from -40 to +212 degree F and includes durable acrylic adhesive that is aging resistant making them versatile for both indoors and outdoors, i.e., high traffic areas, hallways, corridors, machinery, forklifts, shelves and much more. 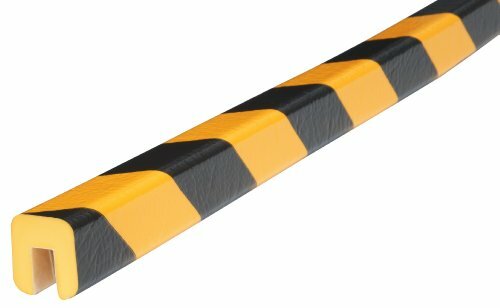 Type A corner bumper has a 90 degree cut-out ideal for corners and other right angle surfaces. Includes 2 self-adhesive strips. Profile body: recyclable polyurethane foam, completely free of CFCs. Surface: polyurethane foam colored by reverse printing and foamed in place so that no paint appears on the outside. Adhesive: Installed using light and ageing resistant, modified acrylic glue. Adhesion: 21N/inch (25-millimeters). Fire Classification: B2 according to DIN 4102 and UL 94HB/10mm. Installation: Simply adhere to clean, grease-free surface. Corner protection A: 0.98-inches.